Feifei Li has won the Best Paper Award at the ACM SIGMOD 2016 conference (the 35th ACM SIGMOD International Conference on Management of Data), for the paper titled “Wander Join: Online Aggregation via Random Walks”. 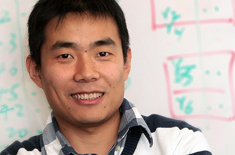 The paper is co-authored with Bin Wu, Ke Yi, and Zhuoyue Zhao. This paper designs a novel approach to perform online aggregation for queries involving joins over multiple tables in large databases, which is an important problem for enabling interactive queries and data analytics for big data. The annual SIGMOD conference is the most prestigious conference on database systems and large-scale data management, and is a highly selective venue of publications. The conference brings researchers and practitioners working in the field of database systems and big data management from universities, research institutions, and companies from the world. This year’s SIGMOD conference has attracted over 1000 attendees.